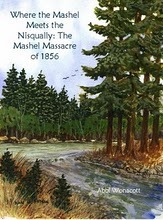 Author Abbi Wonacott writs about the spring of 1856, when Washington Territorial soldiers hiked down to the Mashel River where it meets the Nisqually River outside of Eatonville, Wash., and attacked a Nisqually Indian band trying to hide from the fighting during the territorial wars. Why did they do it, and what really happened? This books helps answer those questions.